I am slightly overweight and feel unattractive. What is the best way for me to lose weight and look better to men? I really want a boyfriend. Actually. I really want to be married. What do I need to do to make this happen? The weight loss industry is currently peddling the Paleo diet of our cave-dwelling ancestors, whose 28-year average lifespans were apparently the very picture of health. If chasing meerkats across the great plains and eating twigs holds special appeal to you, then such a dietary alignment may prove an optimum fit. Je ne sais quoi to club with the finest, locate like-minded spirits by frequenting the local library, exercise emporium or county fair–depending on your priorities. If such a spousal odyssey sounds as tiresome to you as it does to me, I would alternately offer the favorite advice if my amazing spouse: employ a hammer. Hammering is invigorating exercise. It makes you feel better and sometimes even results in the construction of something useful. 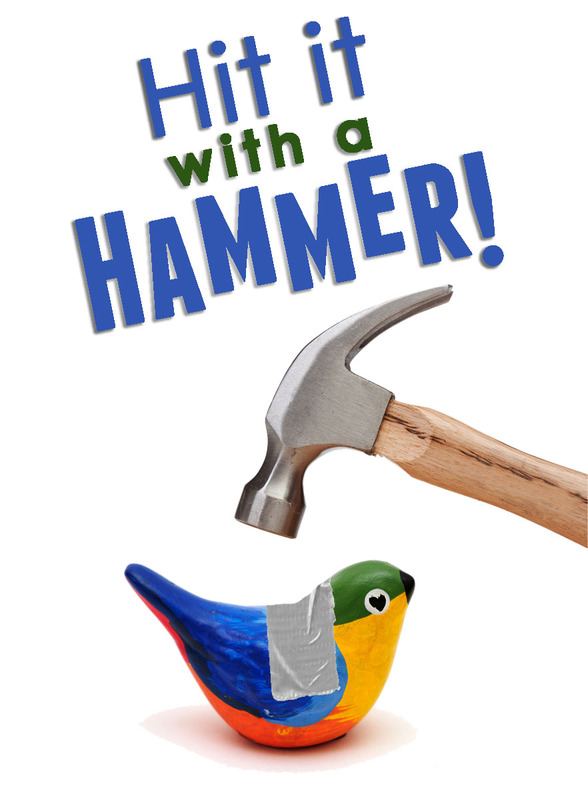 So have at that problem with a hammer! I don’t want to die. I know that no one wants to die but I am really afraid of getting old and dying. How do I stop myself from dying? I eat right, exercise and I am considering gene therapy. I just need a solution to keep myself from growing old which will eventually lead to dying. For eons mankind has floundered on the beach of immortality, which lead to a spate of tiresome vampire books and premium cable shows, as well as the entire vitamin industry. Many approaches are available to address the fear of death and/or non-immortality. Cryogenics is logical but is generally unaffordable for your average plebeian. Additionally, you could find your defrosted head reattached to any manner of future robotic insectoids. Alternately, living each day as it unfurls and not succumbing to trepidations that result in missed meaningful moments with friends, family and endless indulgences may be advisable when becoming a vampire is unavailable. Or you could just hit it with a Hammer. 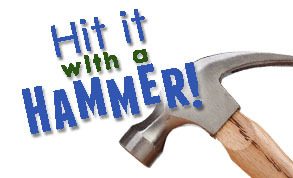 As my delicate flower of a spouse has oft advised occupants of our many investment properties who complain about the crumbling infrastructure of their domiciles: Hit that problem with a hammer. A hammer can fix or break anything. It can tear things apart or put them back together. But it is only as good as how vigorously you apply it to the problem. Hit your dreary dread of death with a hammer, my dear FAD, and enjoy the many luxuries and beauties of this life! How do I get that place called Vine to come and film me? I have some really funny ideas for stories but I need someone to film me. How do other people get their videos up there? I’ve called and emailed Vine and can’t get them to respond. The subtle vagaries that guide men’s selection of leisure time activities are shot through with an almost infinite variety of permutations and depredations. My initial response to your query is to urge extensive reflection on the nature of man and his place in the universe before broaching an extensive exploration of what Vine is. Is it quite possible that you are not funny and no one wants to see your video. My exploration of Vine has proven that there are more people willing to film themselves than there are people with actual talent. But I also recall the frequent and enthusiastic advice of my dearest spouse in such delicate circumstances: Hit it with a hammer. Don’t think about it and don’t wait. Just hit that problem with a hammer and hit it good. A hammer will fix anything including all of your problems. It will even fix the fact that you are not funny. If you have any questions about this advice it is only because you have failed to hit the problem hard enough and often enough with a hammer. This advise is so clear and concise that I am copying most of what I said to the querying woman last week. Recently, I found something hidden in the darkest recesses of my basement. It was slightly rusty but I cleaned it and then spent hours and days carefully applying turpentine to every nook and cranny until the steel was gleaming. Then I stripped, sealed and waxed the old school wood handle. And the hammer was beautiful. But my problem is that my wife left me for another man who is a plumber. I am a lawyer. I used this hammer to fix a book shelf, some siding that fell off my house and to take out nails that were holding up pictures of our family before it broke apart. BUT THE HAMMER isn’t fixing the hurt I feel and I’ve tried hitting everything I can with it. What’s the solution? Ah, the pleasures of restoring an aged and tarnished implement to its previous gloriousness. The experience surely must have elicited near-rapturous joy. Without indulging myself with queries of my own as to the hue and grain of your device, I will endeavor to address your query. First, it is clear to me that life has not been uniformly unkind to you. You were married, an esquire and apparently a homeowner (unless you are wont to destroy rental property). Yet, tragedy has befallen your life of late and you have struggled to accommodate its pernicious effects. In such circumstances it may prove contributive to account for the many positive and uplifting aspects that remain. In such ways many a man has found inspiration to persevere in ways that allow identification of future bonanzas. Alternately, you could hit it with a fricken’ hammer, as my delicate petunia would say. The problem is not the many objects to which you have applied your device. I would hazard that the device itself is the problem. As painful as it may prove I am left to urge you to hit that hammer with another hammer! Don’t be shy about it. Make every swing count. Through the tears, the mud and the blood, just keep swinging, my friend. 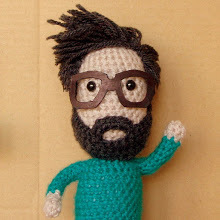 Is it normal for my husband to crochet? Recently he’s started crocheting in public and it’s very awkward especially since he’s the Sheriff and supposed to be tough. He’s made some incredible doily’s and he’s working on an afghan but everyone is looking at him. Recently someone threw yarn bombs on our lawn. Not sure what to do. Please help. The subtle vagaries that guide men’s selection of leisure time activities are shot through with an almost infinite variety of permutations and depredations. My initial response to your query is to urge extensive reflection on the nature of man and his place in the universe before broaching an extensive exploration of your husbands foibles and proclivities. But I also recall the frequent and enthusiastic advice of my dearest spouse in such delicate circumstances: Hit it with a hammer. Don’t think about it and don’t wait. Just hit that problem with a hammer and hit it good. If you have any questions about this advice it is only because you have failed to hit it hard enough and often enough with a hammer. Good luck to you, madam.